As the 16th anniversary of the U.S. invasion of Afghanistan approaches, President Donald Trump is reportedly being pressured by a billionaire financier and a chemical executive to extend the scope of the conflict for one simple, greedy reason: to exploit Afghanistan’s mineral reserves. 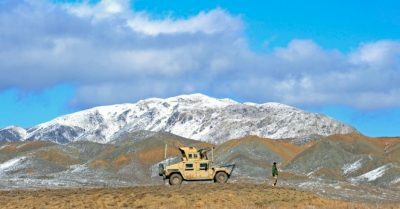 “In 2010, American officials estimated that Afghanistan had untapped mineral deposits worth nearly $1 trillion,” Risen and Landler note. This large figure reportedly “caught the attention of” the president, who has in the past argued that the biggest failure of the U.S. in Iraq was not”taking” the country’s oil. Trump is hardly the first president to notice and eagerly examine Afghanistan’s mineral reserves. Nonetheless, Trump appears to be committed to the belief that mineral extraction “could be one justification for the United States to stay engaged in the country,” despite warnings from security analysts that such a strategy could risk further deadly confrontations with the Taliban. As Common Dreams reported earlier this month, the Trump White House has been consulting with high-profile war profiteers who have argued that the way forward in Afghanistan is to further privatize military operations in the country. White House Chief Strategist Steve Bannon and senior advisor Jared Kushner reportedly “recruited” both Feinberg and Blackwater founder Erik Prince to lay out a war plan for the president. Critics denounced this development as a step toward “colonialism,” and commentators had similar words for Trump’s apparent attraction to Afghanistan’s mineral wealth.